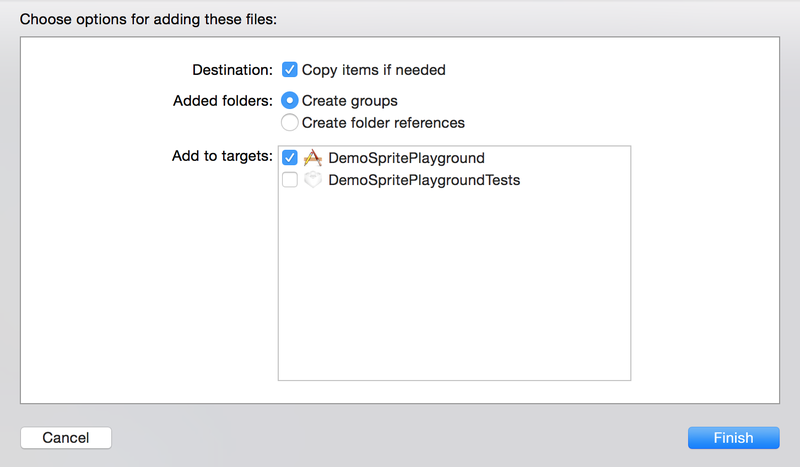 About: This project uses SpriteKit’s level editor interface to create a sandbox for experimenting with various SpriteKit features, including physics interactions and responding to touches. It is intended to be a surface-level introduction to the level editor so you can get setup and start playing around quickly and easily. This project was created in Xcode 6.1.1 using the Swift programming language. The full project can be found here. I also limited my project to Landscape-only orientation for simplicity’s sake. You can change these settings by selecting the project (top-level) in the file browser and checking/unchecking the boxes under Deployment Info. You can get the images/textures used in this project here, or you can use whatever images you want. All that really matters is that you have a background image and some sprite textures to choose from. You should now see the Images folder in your project directory. You won’t need to alter AppDelegate.swift or GameViewController.swift for this project. Now that your project is a blank slate, we’ll get started with Xcode’s extremely useful Level Editor interface. This is also referred to as the “Level Designer” or “Scene Editor,” the latter of which seems only to be the case in projects that use the SceneKit library (as opposed to SpriteKit). Fair warning: I may use these terms interchangeably throughout this tutorial — be aware that other resources you use may refer to it as something else. Please visit the Techotopia page linked above to read this great tutorial! (A) Scene Canvas – This is the canvas onto which nodes may be placed, positioned and configured. (B) SKNode Inspector Panel – This panel provides a range of configuration options for the currently selected node in the scene canvas. (C) Object Library – The Object Library panel contains a range of node and effect types that can be dragged and dropped onto the scene. Clicking on the far right button in the Object Library toolbar displays the Media Library containing items such as textures for sprites. (D) Simulate/Edit Button – Toggles between the editor’s simulate and edit modes. Simulate mode provides a useful mechanism for previewing the scene behavior without the need to compile and run the application. 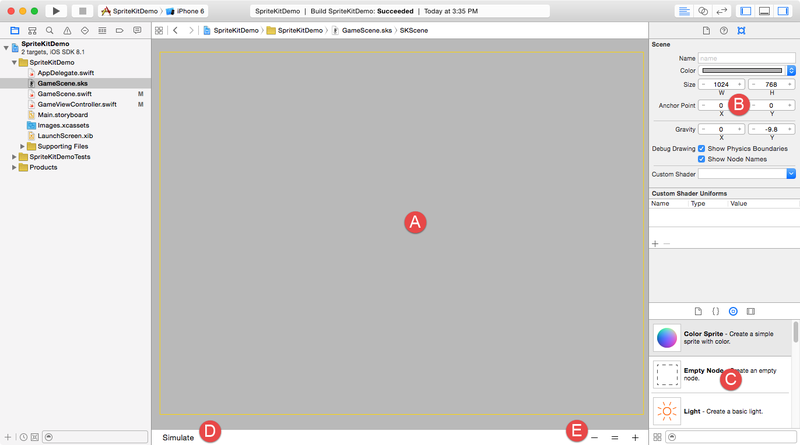 (E) Zoom – Buttons to zoom in and out of the scene canvas. You’ll notice right away when using the touchpad or a mouse wheel to zoom that for some reason, zooming and scrolling are inverted in this interface. If it really bothers you, just use the zoom buttons. Build and run the project, and you should see the background image as expected. That was rather painless, right? Note: In this case, we don’t have to reposition or scale the image, since we’re using an oversized image to begin with, but if you’re using an image that is exactly the size of the screen, it may not appear where you expect. This is because addChild adds new sprites at position 0, 0 (bottom left corner) by default. If you want to use an image sized specifically for your screen, you’ll have to change its position. First I’m going to make you delete what you just did (sorry!) and show you another way to accomplish the same thing, with a little more control. Go to GameScene.swift and remove the two lines you just added to the didMoveToView method. Now click on your GameScene.sks file to see the level editor interface. What I’m about to show you is so stupidly easy I’m almost hesitant to recommend it. All you have to do to add your background sprite to the scene is click the genericBg.jpg file in your project directory and drag it onto the scene. Boom. Done. Why did I make you add the background both ways? Well, if you’ve ever added sprites programmatically before, you know that doing any additional setup (positioning it, giving it a physics body, etc.) requires many more lines of code. With the level editor, you can accomplish most of this simple setup without writing a single line of code. Size: 1024 x 770 — or whatever size roughly fits the scene’s boundary. Position the background so that it covers your whole scene. Use the same method outlined above to add some other sprites to your scene. In my example, I’m using the genericBigCircle.png and genericBigSquare.png images. Position them wherever you want on screen, then click the Simulate button. You should see your sprites fall right off the screen! The level editor’s Simulate feature is an excellent way to test physics interactions without having to build and run the app. Give each sprite you added to the scene a unique name. This will be important when we want to make them respond to touches. I named my sprites “square1” and “circle1” for their respective shapes. For now, we don’t want our sprites moving around unless we tell them to. For each sprite you added, uncheck its Affected By Gravity property (under Physics Definition). You can also change the Body Type if you want. Changing this setting to Alpha mask will result in the sprite having a physical body exactly the size and shape of the sprite itself, which allows for the most precise interactions. There are many other settings here we could get into, but we’ll leave those for a more in-depth guide in the future. Choose whichever method best suits your project, or do it both ways. We’re going to make our sprites into selectable objects so we can drag them around the screen and make them run into one another, for science! All of the code in this section should be inside the GameScene.swift file. static let Circle : String = "circle"
static let Square : String = "square"
static let Background : String = "background"
This method gets the sprite node at the touched location, if one exists. Note: In this project, a node will always exist, since the background is a sprite itself. This means we'll have to do some special handling to determine the type of sprite selected. // Record initial location of touch. // Select the sprite where the touch occurred. Since touchesBegan takes an NSSet of generic objects, we need to get one object and cast it as a UITouch so we can access information about it. locationInNode(self) gives us a CGPoint where the touch occurred. We’re telling it to look for a point relative to the whole scene (a.k.a. “self”). Finally we’re calling selectSpriteForTouch with the location of the touch. How do we go about actually telling the game which sprite to select? Does GameScene.swift even know about the sprites in our .sks file? We have no references to the sprites in code, so how do we “find” them? // Get the node at the touched location. To ensure this works, run the project and touch some sprites, then check the console output. Make sure you also click the background! The sprites we added with the level editor are Optionals, which will need to be unwrapped if we want to access or change some of their properties. We are able to select the background, which means our sprite selection just got a little more complicated. There are many ways/places to do this, and I can’t promise my way is the best way or even a good way, but since our end goal here is really to give you a sandbox to play in, it will have to suffice. // Reset selectedNode (prevents selectedNode from "snapping" to touched location). // Thanks to Robin from the comments section for pointing this out! // Store the selected node for future use. It’s important to note that touchedNode.name will require unwrapping in order to use hasPrefix(). In this case it’s safe to explicitly unwrap since we know every touch must be inside the boundaries of some node. Also note that this won’t work if you forgot to name your sprites when you added them to the level editor or if you forgot to add the SpriteType struct to top of the GameScene.swift file. // Record location of touch. // Define a movement action for the sprite. // Move the sprite (if one was selected). It captures the location of the touch, just like touchesBegan. The difference between the two methods is that this one will fire constantly, as long as the touch keeps moving. moveAction is a variable that stores an SKAction, which is something that can be enacted upon a sprite using the SKNode class’s runAction method. SKAction.moveTo takes a CGPoint for the location to move to, as well as a duration (how long should moving there take?). Finally, it executes the action on the selected node, as long as selectedNode is not nil. Now if you build and run your project, you should be able to touch and drag your sprites around the screen. Try running one into another to see what happens (notice the abysmal FPS — thanks Quicktime!). If you’ve gotten this far, you technically have all you need to create a sandbox environment for experimenting with sprite creation, selection, and interaction, but check back in the next couple weeks for a forthcoming post involving gravity fields, particle emitters, and other awesome things from the level editor’s object library. In the mean time, I encourage you to delve deeper into the level editor’s features on your own, especially setting sprite properties in the node inspector panel and adding new nodes from the object library. Also please share anything interesting you discover! WWDC 2013 Session Videos: If you have 30-60 minutes to kill, Apple’s own “Introduction to SpriteKit” and “Developing Games with SpriteKit” provide a good jumping off point. Just be aware that videos from 2013 will be in Objective-C, so you’ll have to do some translating if you want to put any of it into practice. WWDC 2014 Session Videos: “Best Practices for Building SpriteKit Games” and “What’s new in SpriteKit?” are both useful in their own right, and are great followups to the 2013 videos. How to Make a Line Drawing Game with SpriteKit (Ray Wenderlich): I’m a big fan of all of Ray Wenderlich’s tutorials. This one explains how to use SKShapeNodes to add custom drawing to something very much like what you already have. How to Create a Breakout Game Using SpriteKit and Swift (Ray Wenderlich): This one will teach you a lot about basic physics and collision handling. Simple iOS Breakout Game with SpriteKit: For the video-oriented — this one will teach you virtually the same things as the Ray Wenderlich tutorial above. Nice catch, added it to the tutorial. Thanks! code does not work with Xcode 6.3.1. It is loaded with errors. Thanks for the heads up! Can you elaborate? I suspect this has something to do with casting, but I just started a new job and haven’t had the time or inclination to jump back into Xcode. If it’s something simple I’ll happily update my guides this weekend.